Happy Wednesday y'all!! Sorry I didn't post earlier this week, I was sick with the flu and I'm still getting over it. So I'm going to keep today's post short! I'm showing y'all my third look from my Studio 5 - Style File: 5 Spring Wardrobe Staples segment. This Spring everyone needs to have a black and white piece in their closet, and I mean have both colors together in one piece. I love pieces that are black and white, its such a clean and fresh look, but yet bold. 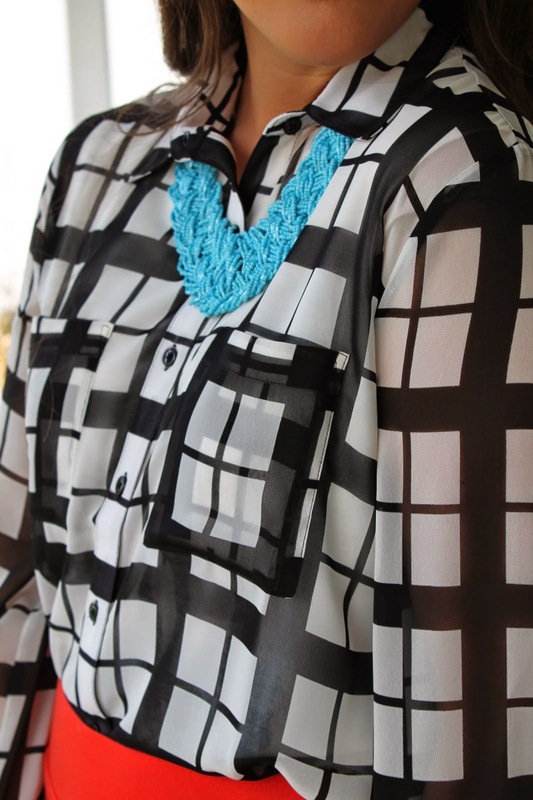 The contrasting colors make it a very cool and refreshing look. And you're getting both the staple colors in one piece. I love pairing it with pops of color like I did here with the blue and red! Lily I love this outfit. It is really cute. Love that you paired your white and black shirt blouse with that cute red skirt. Stopping by from the I feel Pretty Linkup. Cute outfit! I love that necklace! Coming over from the I Feel Pretty Link-up. Your blouse is beautiful and love that necklace with it.